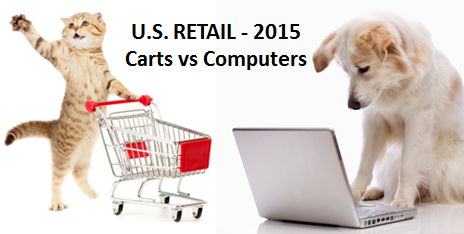 U.S. Retail Market – 2015 Midyear Update: The Race for the Consumers’ $$$? Restaurants (Food Service) – are having a good year, up↑8.97%. However, they are not really relevant. They are 12% of the Total and removing them lowers the increase to 1.2%, almost half. Automobile Sales – are also doing well, up↑7.43%. These big ticket items are also not very relevant in the Consumer Packaged Goods business and they are 21% of the total. When you remove Auto and Food…the numbers go negative! Down ↓0.65%. What is driving this Drop? 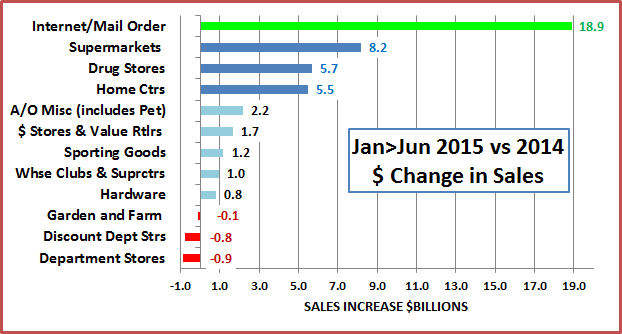 Retail, Less Food, Auto and Gas – Up 3.1% to $1.5 Trillion in the first half of 2015. This is 58.4% of the total U.S. Retail market and it is growing 50% faster than the Total…and Very Relevant! Regardless of how you look at it, the first half of 2015 was not as robust as the past two years. In the “best” case in the graph, the rate of relevant U.S. Retail growth is 14% less than in 2014. However, the graph does give us a benchmark to measure the performance of specific retail segments. If their growth exceeds 3.1%, then they are gaining market share. If it is less than 3.1%, they are losing market share…even if sales are up! Let’s look at how the major retail segments are doing. These are large slices of the U.S. Retail pie. Three divisions – General Merchandise Stores, Food and Beverage and Non-Store account for 58.3% of the total market. 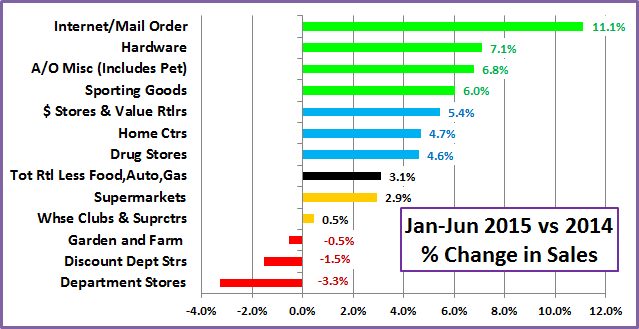 If you look back at our post on the channel migration of Pet Products Sales, you will see that in the 2012 these divisions produced 59.7% of total Pet Products sales. Consumers spend a lot of money in Pet Specialty Stores but Pet Products are also “on the shopping list” in the outlets where they spend most of their money. 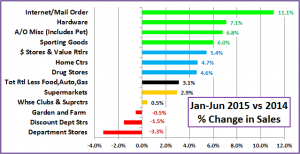 Major Divisions of the market generally don’t show much movement in market share in just one year so the change in the General Merchandise Stores and Non-Store “Divisions” is very significant. Each of the major divisions includes a number of subsegments. General Merchandise includes Traditional Department Stores, Discount Department Stores, Supercenters and Clubs as well as $ and Value Stores. These specific retail channels often have far greater movement in share because this is the level that the consumer “views” in making their initial shopping choice. Enough “overview”! Let’s look at the first half performance of some of the specifically “Pet Relevant” Channels to see which are doing the best…and worst in gaining consumer spending. We will use 2 separate graphs to illustrate the situation in these 12 Channels. 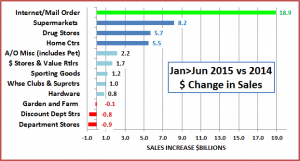 The first will show the % change in sales in 2015 vs 2014. The next will “show us the money” by translating the % into $ gained or lost. Then we will wrap it up with some observations by channel. The growth in the Internet is even more pronounced when you look at the change in $ spent! Internet/Mailorder – $188.8B, Up $18.9B (+11.1%). 42% of the total increase for the $1.5T Retail Market (1st Half Total) came from Internet/Mailorder. The Consumer Migration to this channel noted in a post documented earlier this year…is accelerating – gaining 0.9% in Total Market Share in just a year. 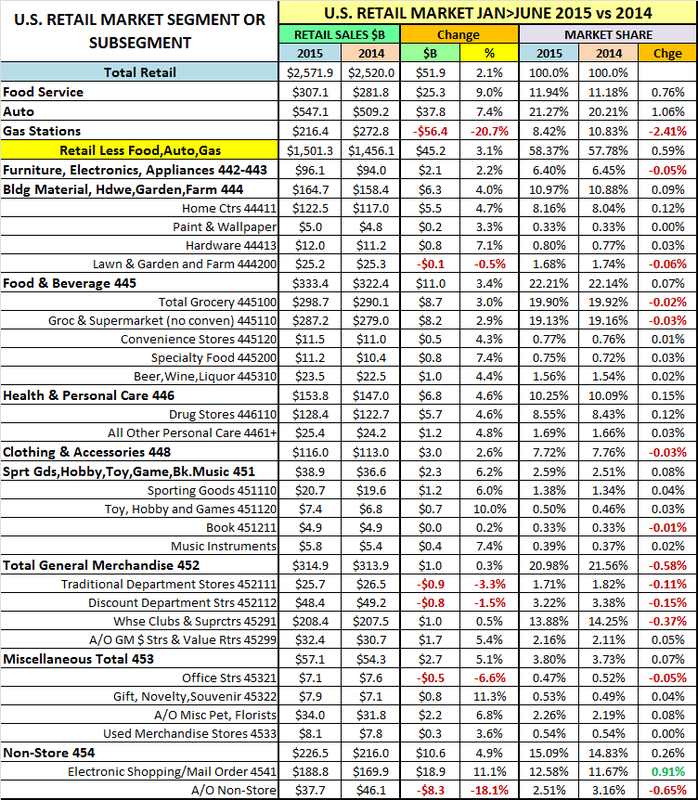 Super Markets – $287.2B, Up $8.2B (+2.9%) This largest subsegment is barely holding its own as it lost 0.1% in Market Share. Right now the major competition is from SuperCenters/Clubs. We’ll see if the Internet becomes a factor. Department Stores – $25.7B, Down $0.5B (-3.3%). This segment is not particularly relevant to Pet but I included them as they are part of the best “visual” example of the channel migration of the U.S. consumer. 50 years ago they “ruled” the GM category. Then they started to slide as they failed to adapt to the changing wants and needs of the consumer. One small example of this is their failure to address America’s growing relationship with our companion animals. Discount Department Stores – $48.4B, Down $0.8B (-1.5%). The rise of this segment started the downhill slide of Department Stores but their tenure at the top was brief as the SuperCenters/Clubs offered true 1 stop shopping. SuperCenter/Club Stores – $208.4B, Up $1B, (+0.5%). These outlets with their broad mixture of grocery and general merchandise…at great prices quickly became a dominant force in the retail market. They are second only to Supermarkets in Retail Market Share. However, they “needed” to be up $6B in the first half of 2015. They lost 0.37% in Market Share, one of the biggest drops of all the U.S. Retail Channels. $ & Value Stores – $32.4B, Up $1.7B, (+5.4%). – A Great Value and easy to shop. The growth in this segment is visible proof that American consumers want Value AND Convenience. Drug Stores – $128.4B, Up $5.7B, (+4.6%). 60+% of revenue comes from Rx Drugs. The growth in this segment is largely due to a 5.4% Increase in Rx Prices over the same period in 2014. Sporting Goods – $20.7B, Up $2.3B, (+6.2%). A minor player in Pet, this segment enjoyed a strong first half in 2015. Home Centers – $122.5B, Up $5.5B, (+4.0%). These “project driven” outlets have never done a significant Pet Business. Their growth is tangible evidence of the recovery from the recession. Hardware – $12.0B, Up $0.8B, (+7.1%). Exceptional strength in this minor Pet segment. Once again evidence of ongoing economic recovery. 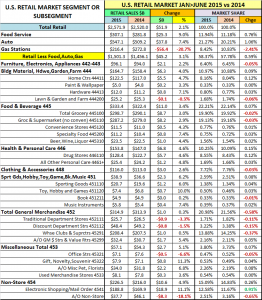 Farm and Garden Stores – $25.2B, Down-0.1B, (-0.5%). This segment had been showing growing strength in both Pet and Total sales. Spring is their largest “lift” season. We’ll have to wait until yearend to see if this year’s drop was an anomaly or reflective of an overall trend. A/O Miscellaneous Stores $34.0B, Up $2.2B, (+6.6%). Florists, Pet Stores, Art Dealers…there are several segments bundled into this group. Based upon detailed data from the 2012 Economic Census, Pet Stores probably account for about 25% of this segment. 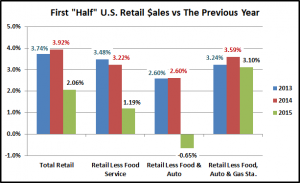 With few large “chains”, this growth speaks well for “smaller” U.S. Retail Businesses…at least in the first half of 2015. Now let’s wrap it up with a brief summary…and provide you with the detailed data for future reference. There is no change at the top. 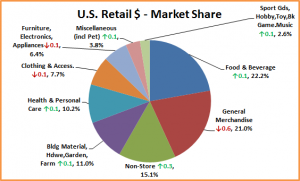 Supermarkets remain the largest Retail Channel, followed by SuperCenters & Club Stores. The Internet/Mailorder segment is growing even faster than anticipated. Gaining 0.9% in Market Share in a $3T annual market in 1 year is definitely fast. However, this is just the first half. We’ll see if this Channel can maintain this pace for the whole year. If the current trends do continue, Internet/Mailorder could take over the #2 position in the U.S. Retail economy in as little as 2 years. You also have to wonder what will happen when the internet turns its attention to grocery items. There are other notable points that relate to the Pet Industry – the continued growth of the $/Value Stores and the unexpected strength in the A/O Miscellaneous Channel. Bottom Line: The U.S. Retail Market is evolving as the consumer migrates to the channels which best fulfill their current wants and needs. To survive and prosper, you must identify those needs and adapt. Contact me if you would like an Excel version of this detailed data!